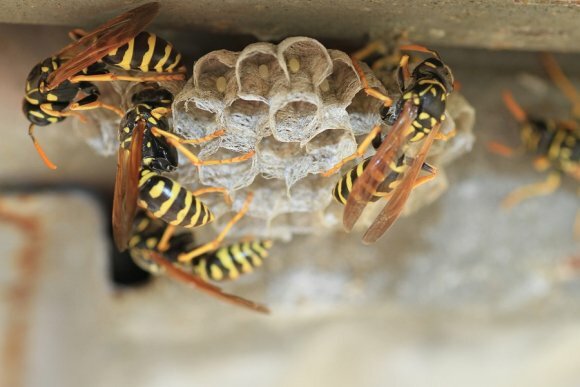 Removing nests belonging to bees, hornets, wasps, and other stinging insects on your own might sound like a good idea, but you should always call on a trusted bug exterminator to get the job done. Schopen Pest Solutions has the experience, knowledge, and equipment that you need to complete bee, hornet, and wasp removal near Crystal Lake . If you choose to tackle bee hive removal without the assistance of a professional pest control service, you could be putting your own health as well as the health of your family at risk. Many species of stinging insects aren’t naturally aggressive, but they will often become agitated when their nests are disturbed and try to sting whoever is disturbing it. A good bug exterminator will be prepared for this and will minimize the disruption that is caused so that the stinging insects can be removed from your property without incident. When you call on Schopen Pest Solutions to be your pest control service, you can rest easy knowing we will get rid of your problem.